Caregivers in Knightdale NC: Should You Feel Guilty About Negative Emotions When Caring for a Senior with Cancer? Should You Feel Guilty About Negative Emotions When Caring for a Senior with Cancer? Being a family caregiver for an elderly adult who is living with cancer can be extremely rewarding. This is an opportunity to help them through an incredibly challenging time, and make sure they are getting everything they need to manage the disease and maintain their highest quality of life. This is a wonderful way to show your parent you love them, and a meaningful way to give back. But it can also be challenging, emotionally difficult, and painful. You are likely to find times when you are overwhelmed, frustrated, and even don't want to be managing these responsibilities. As you are going through these emotions, you may feel guilty you are experiencing them. It is important to realize that these negative emotions are nothing to feel guilty about. 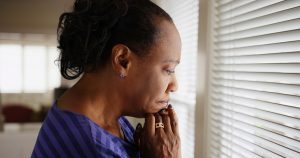 Depression, anxiety, sadness, and stress are all common among family caregivers, particularly those who are caring for an adult who is living with something as severe as cancer. It is important to remember you are not just managing the care tasks of an adult with cancer. You are going through a challenging time with an adult you love, and this is going to create emotional responses. Releasing this guilt and managing your emotions effectively is a vital part of preserving your mental and emotional health now and into the future. It's never too late to enjoy a high quality of life. Home care can help your parent achieve and maintain this type of life as they age in place. Services are totally personalized, which means your parent is going to get the care they need, when they need it, to handle their needs in the ways that are right for them. As their family caregiver, you can not only feel more confident in their care and ongoing well-being, but can also experience less stress in your own life. IF YOU OR AN AGING LOVED-ONE ARE CONSIDERING CAREGIVERS IN KNIGHTDALE, NC, PLEASE CONTACT THE CARING STAFF AT SENIORS HELPING SENIORS TODAY. CALL (919) 761-5346.